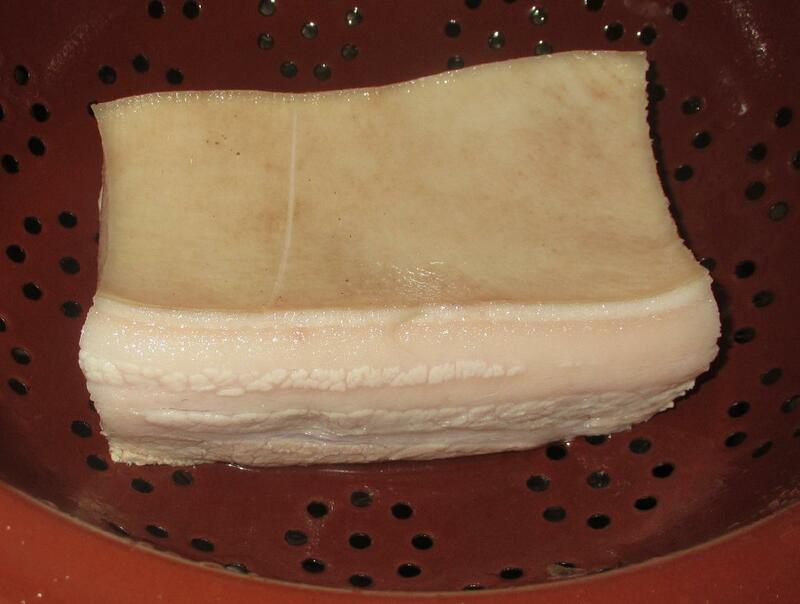 To make Dongpo Pork, you need a single large piece of pork belly with the rind still attached. This is a fatty cut, and it is this that makes the dish so unctuously good, but try and select a piece that is nicely streaked with lean. I am not a big fan of Star Anise, so I am omitting it myself, but it is a pretty common addition. Some recipes suggest you add five-spice powder but I don’t recommend this. You could, if you like, also add a cinnamon stick, some fennel seeds, or even a strip of dried orange peel. The first step is to scald the pork in boiling salted water and let it cook for a few minutes. This allows a little of the fat to render out and ‘cleans’ the surfaces of blood or other impurities. Once done, rinse the chuck of meat in cold water, making sure to wash away any clinging residue. 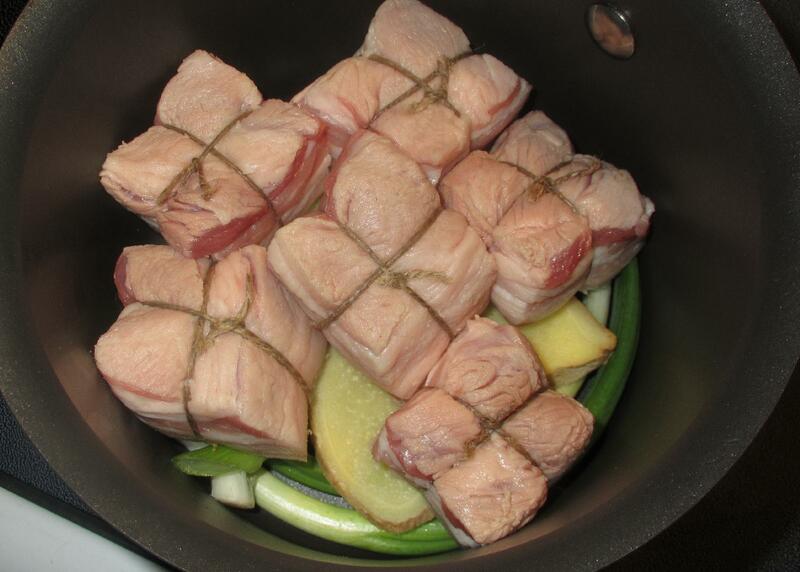 Allow the pork to cool and then cut into chunks about 1 – 2 inches square. 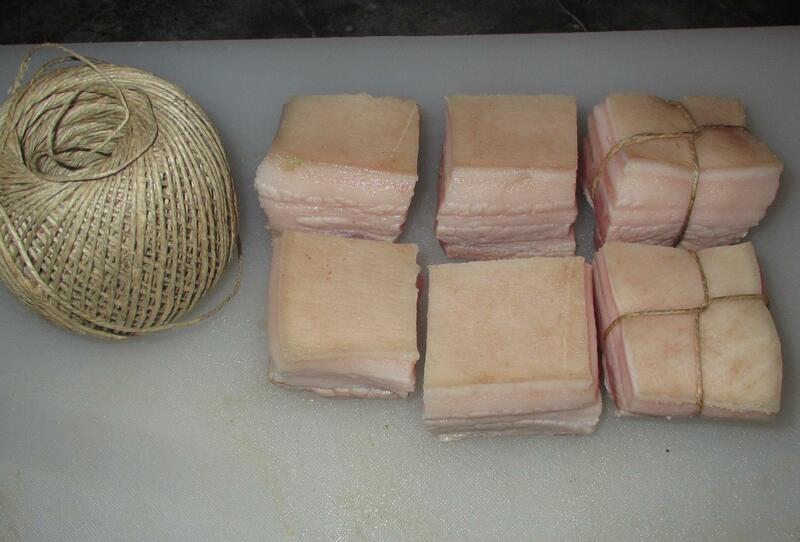 Quite often, the pieces are then secured into bundles, supposedly to help them stay together over the braising process. To be honest, this really shouldn’t be a problem and you can skip the step if you like, but it does have a certain visual appeal in the finished dish, so I have done it here. 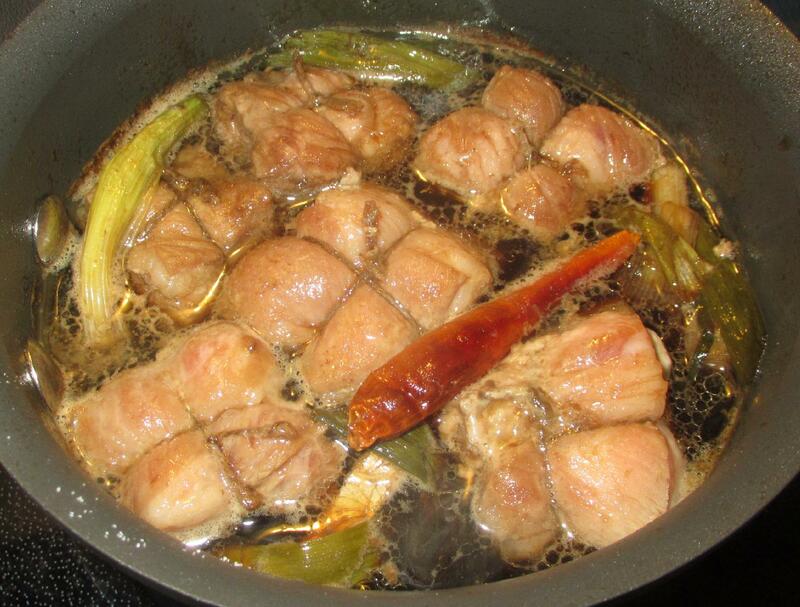 Now, put the scallion and ginger in the bottom of a small pot and lay the pork belly, skin side down, on top. Add the remaining ingredients and bring the pot to a gentle boil over moderate heat. Once it is just starting to bubble, turn the heat down to low and simmer very gently for about two hours or so until the pork is very tender and can be easily pierced with a chopstick. You may wish to turn the pieces over about half-way through, and you can skim away any frothy scum or excess fat that might arise. Once the pork is cooked, remove the pieces to a warm serving dish and strain the cooking medium, returning it to the pot. 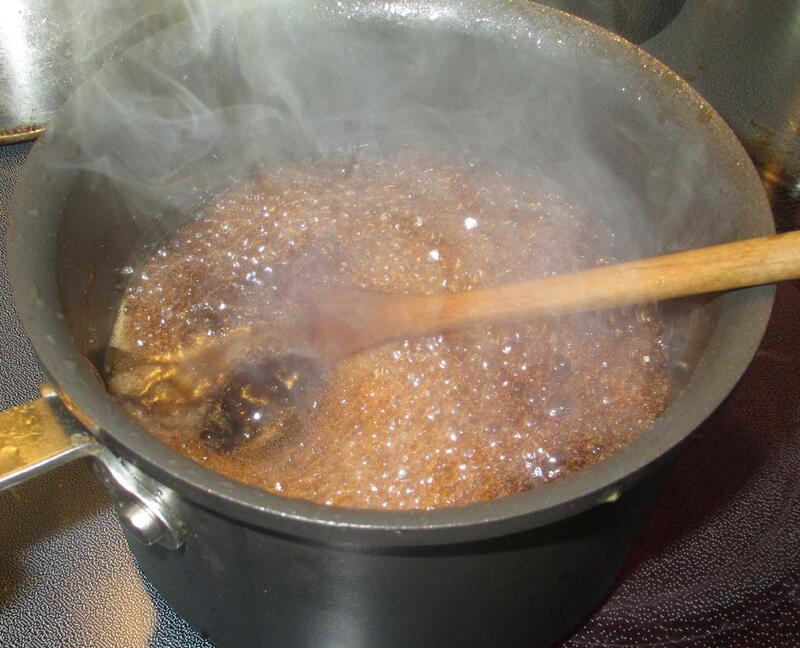 Turn the heat to high and then reduce the liquid until it is about half its original volume and forms a fairly thickish, glossy sauce. Pour this over the pieces and serve while hot. You may very well not need all the sauce and any leftovers can be stored as the base for another batch, a dipping sauce, or other uses. 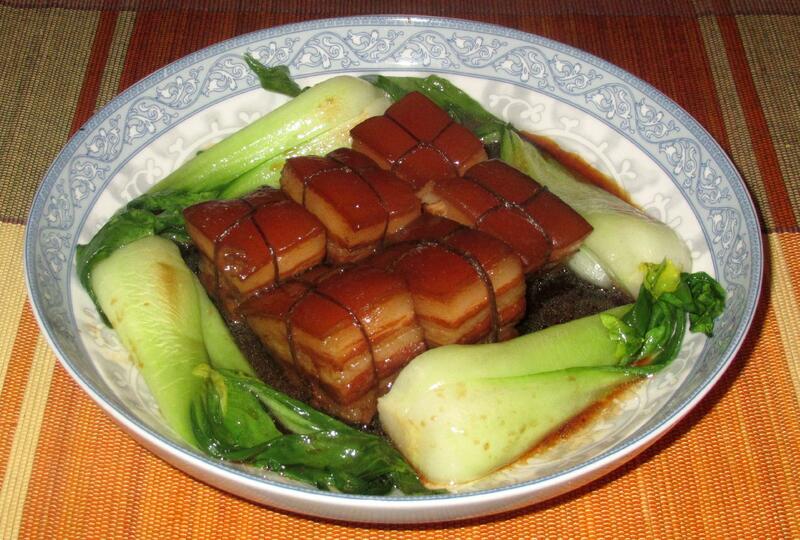 The pork is very nice over rice or noodles and Bok Choy, as pictured above, makes a great accompaniment…. That looks amazing. 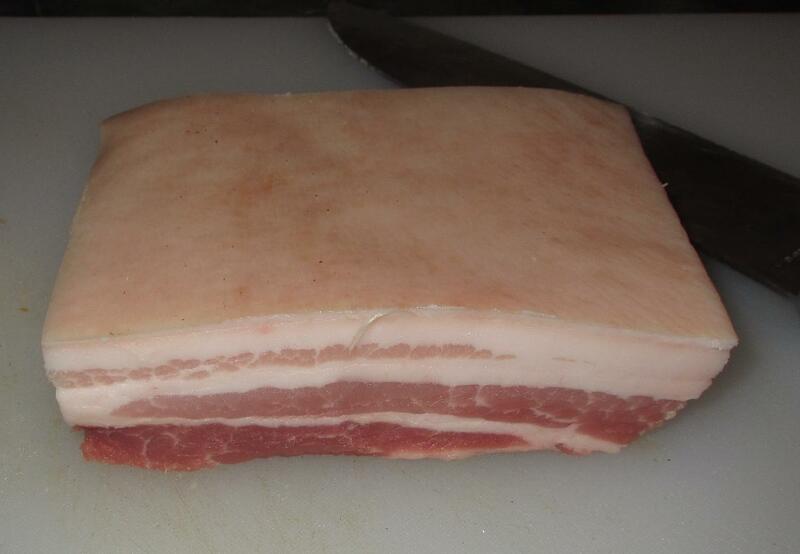 Any reason to cook pork belly is a good reason for me. Have not made this quite awhile – but your recipe allowing two opportunities to lessen the amount of fat in the dish, it is now situated atop my kitchen ‘to do’ pile! I love star anise, so no problem there and next time around the strip of orange peel also will be added. Lovely presentation. One of my favorite dishes, I sometimes all dried tangerine peel.